Swedish Coin ORE Crown Moneyclip adds a royal presence to any attire whether you are in jeans or a business suit. The three crowns represent the monogram of King Gustav V, the oldest ruling monarch in Sweden's history. The bronze coins are encased in a rope bezel. 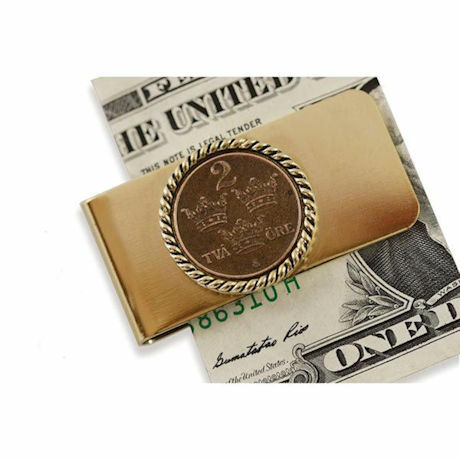 The moneyclip is layered in 24K gold. A Certificate of Authenticity is included. Allow 2-3 weeks for delivery. No rush delivery or gift box. Item can only be shipped within the Continental US.